Rambling Moose: Rack At The Window? Must be Kirby. There are a few people that my dog, Rack likes. Let me rephrase it. 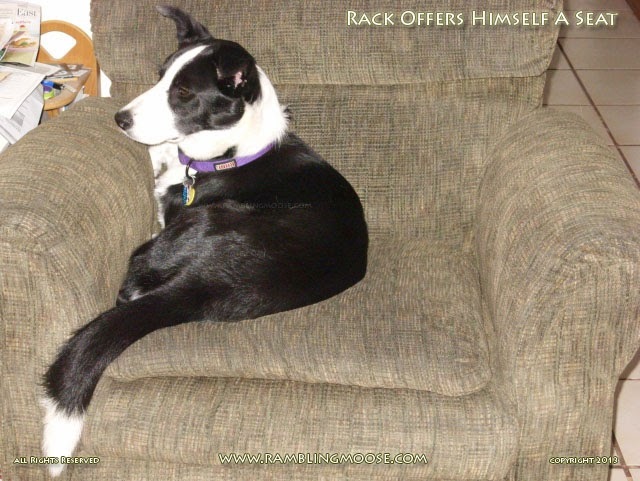 There are a very few people that my dog Rack likes. The rest he's afraid or even terrified of. We've had him for a bit more than a year now, and I expect that he will always be wary of strangers, even the strangers he sees around the house like neighbors, mailmen, and the dreaded UPS truck. Not the driver mind you, but the actual truck. Our normal UPS guy is a real nice guy, and I work to make sure that Rack doesn't develop that Hair Trigger. Yes, if your dog barks at the window insanely when a leaf moves in the next city, it is your training that needs to be looked at. No, you silly furball, you didn't help and it's annoying. So developing the habit of climbing on furniture so they can see outside is not exactly optimum. With a fearful dog like mine, I have to watch just how much freedom I can give him. Not On The Furniture is a rule here. 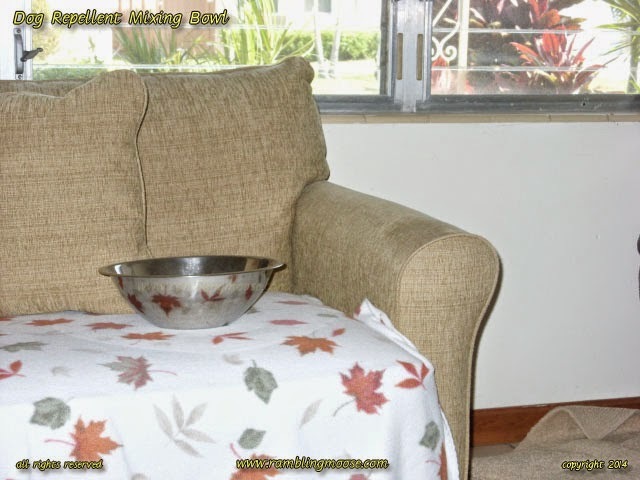 There are metal bowls on the couch. My favorite mixing bowl is on there right now, in fact. If I want to make some cake or pancakes, I have to go to the living room to get it off the couch. Not whipped cream. Never whip cream in a metal bowl. The leftover oils on the metal will make your whipped cream collapse or fail to rise. But Rack has his favorites. In fact, some people I wonder if I'm chopped liver over. Across the street lives Kirby. Kirby has a motorcycle. Motorcycles are loud, but he cuts the motor when he comes onto the block. Nice guy. Really he does go out of his way to not be a nuisance. He also has a "Big Boy Truck". Giant beast of a black Ford F250 with a giant Diesel motor in it. While Diesel is the only way to go with a vehicle when you have a choice, they have their drawbacks. In the case of the big boy truck, it's loud. Turbocharged loud. Accelerating that beast down the block up to even the posted 25 means the waste gate will open and the turbo will whistle. Does anyone do the speed limit when it's only 25? Well yes, we tend to here. We've got old folks, and kids, and no sidewalks. Anyway, since Rack is terrified of loud noises, I used Kirby to my best advantage. He doesn't mind, and it worked. Maybe it worked a little too well. Now, every motorcycle is Kirby! and every loud turbodiesel truck is Kirby! and Rack loves them. Rack is incredibly well behaved inside the house, preferring to hide in the corner behind the big green chair than lay down on the tiles in the main room until after dark. So it takes a lot to get him going. The other day he was back in the back of the house minding his own business. That is to say, we were doing something back there that he decided needed supervision and since all the people were in one room, he was successful in herding them there. Dog Logic. It's a sick and twisted thing. All the sudden ears went up. I mean UP! Then he ripped tires moving out of that room. If you have never seen a herding dog go after something that needed to be herded, this is something to be seen. Even if it is in your own house, 45 pounds of mostly black dog running for the front room means that you need to go find out what he's up to. I rounded the corner into the living room muttering to myself "I wonder what got into him?". Clearing the lamp on the wall, I see Rack sitting by the window next to the couch, nose up in the air and listening. His ears don't "perk" completely unless he is excited and I think they were inflated to 40 PSI that day. Tail wagging quickly on the ground, he was doing a great job of reminding me I needed to run the vacuum today. Then all the sudden he did it. He stood up slowly and put his paws on the window well. Tail had went at that point into super happy fun speed. There was a disco beat of the tail against the couch at first, then it went into "Uplifting Trance Who's Afraid of 138 BPM" speed. I saw what was going on. Kirby was out with Bonus Rottweiler Sauce! He had just stepped in front of our house with his 165 pound dog, D.O.G. "Dio" to his friends. We are definitely his friends. If you haven't had a giant dog lumber across the street To! Meet! You! and plaster himself against your legs while his "innie" of a tail stump is waggling fast and furious, well you haven't lived! Never missing a beat, I did the worst thing that I could do when training a dog. I don't mind him going up onto the window well there, and only there. Since he is a McNab Dog, I fully expect him to understand the distinction - here but nowhere else. I fed into the excitement by saying "Kirby! Kirby, Rack, Kirby!". I swear, Rack is trying to speak. He isn't at all clear from an "English" standpoint but I heard something that sounded like "bdrdrdrdrdrrrrow row rirrrree". I watched enough Jetsons cartoon reruns back in my childhood that every dog I ever met, I listen for Astro Speak. Rut Roh, Roerge! That sort of thing. I realize that anthropomorphizing a dog's frenetic vocalizations is a fun game the whole family can play, but it doesn't usually mean anything. In Rack's case, who knows. But he does love Kirby, and in this particular case, I would like my chopped liver with onion on some good toasted Jewish Rye, thank you.